With the Clear Bio-compatible (MED610) material, you can rapidly prototype medical and dental products including dental delivery trays*, surgical orthopedic guides and hearing aids. The medical rapid prototyping materials offer excellent visualization and great dimensional stability. It features high dimensional stability and colorless transparency. The material is ideal for applications requiring prolonged skin contact of more than 30 days and short-term mucosal-membrane contact of up to 24 hours. 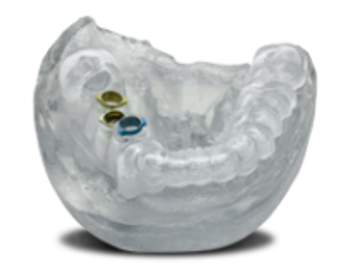 *Stratasys also offers three specially engineered dental materials – VeroDent, VeroDent Plus and VeroGlaze. Please contact Stratasys for more information on dental materials.